From the FM radio and steamboats to modern robotics and lasers, Columbia has been an engine of innovation and a pioneer in technology since its founding in 1754. As an Ivy League institution, Columbia offers a renowned liberal arts education within the nation’s most global city—a place for problem solvers and thinkers to make an impact on a grand scale. 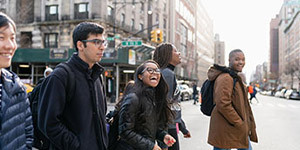 A 36-acre campus in the Upper West Side of Manhattan, Columbia is a residential university with four years of guaranteed housing for incoming first-year students, creating a community composed of one of the most diverse, talented student bodies in the world, coming from 50 states and over 90 countries and with more than half self-identifying as students of color. While undergraduates can choose from more than 150 study abroad opportunities, New York City itself serves as a global experience, giving you an unparalleled place to discover and explore the scientific fields through opportunities in research and entrepeneurship. More than a third of incoming Columbia College undergraduates choose Science majors. 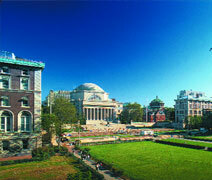 When you include Columbia Engineering majors, half of our undergraduates are majoring in Science or related fields. Most Science departments have a 3:1 student-faculty ratio. Professors here are world-renowned in their fields yet keep open office hours and teach and mentor undergraduates, inspiring their students to take their own giant steps. No matter your major or department, at Columbia you join a collaborative academic community that emphasizes the interdisciplinary nature of scientific inquiry. The Core Curriculum cultivates the critical and creative capacities of students to lead in the fields of science and beyond. Our Engineering curriculum engages students to solve the greatest challenges facing society through entrepreneurship and innovation, a spirit we call Engineering for Humanity. 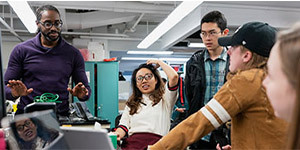 Columbia Engineering focuses on interdisciplinary collaboration through the hands-on first-year introductory engineering class, our Core Curriculum, and more than 20 minors in the liberal arts. Opportunities for research at Columbia—which exist in the hundreds for undergraduates—are never bound by departmental structures or majors. We meet 100% of the demonstrated financial need of every admitted first-year student who has applied for financial aid, and we continue to meet 100% of demonstrated financial need for all four years of study. Admission to Columbia is need-blind for US citizens, permanent residents, persons granted refugee visas by the United States, and undocumented students. We award financial aid to foreign students, though financial need is taken into consideration at the time of admission. Our need-based aid is in the form of grants and student work only. Loans are not used to meet financial need. At Columbia, we are pushing the conversation of discovery forward every day.